Pineapple, mango, and coconut were a luxury growing up in Germany let alone in my mom’s native Greece. No wonder I turn to them in the chill of winter when dreaming of the ocean is pretty much all one can do in the Boston area, especially with the recent #snowmageddon2016 approaching. While our city was spared the mountains of snow DC and NY witnessed this year, at least so far (! ), the longing for warmer temps is here to stay until spring. So all cooped up inside, with eyes on the approaching storm, it was the perfect time to fine-tune this recipe which I’ve been making for years. Dried pineapple, mango, and candied ginger can never go wrong as a flavor combination. 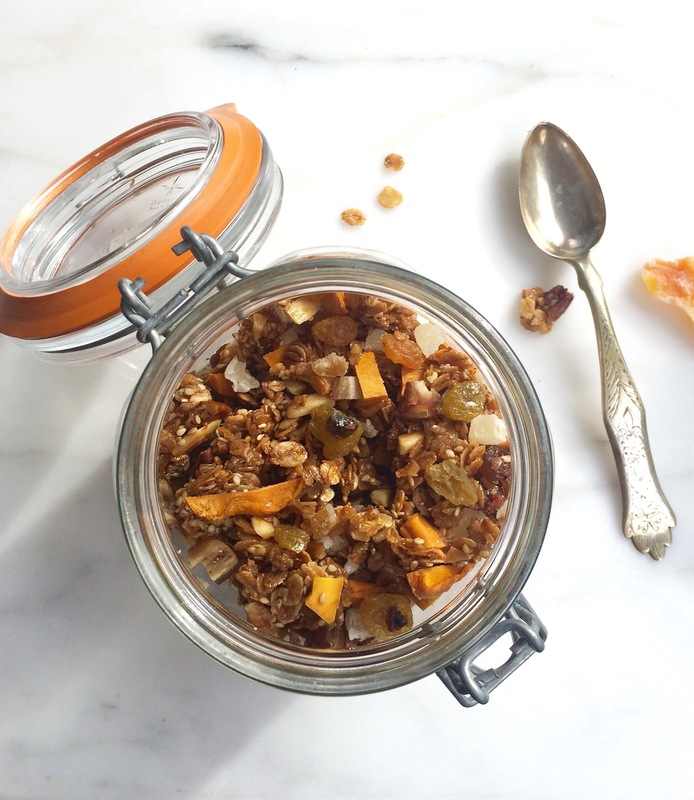 Shards of flaked coconut, combined with fragrant toasted pecans and almonds, add chewiness and crunch. And, in a bowl, this concoction can transport you afar—which in my case will always be coastal sands and deep-emerald waves. All these years, I was faced with one obstacle to publishing this recipe. I really wanted the lime zest to shine. But it kept disappearing among the other flavors during baking—regardless how much I kept adding. I believe I finally found a way. Beyond adding a good amount of zest to the granola, and not from the start but halfway, I also sprinkle some on top the moment it comes out of the oven. This dries out the zest just right but adds a flavor boost which otherwise would be lost in the heat of the oven. Serve with Greek yogurt or milk, or enjoy for a snack as a treat. This is a huge honor, nothing short of amazing. But, as so often, it started with a crazy idea that led to endless rounds of testing—and way too much polenta to eat. Numerous pots later I felt exhausted, I began to dislike my favorite comfort food, and I was ready to give up. In my despair, I sent the recipe to my best friend in Boston who incidentally is an Italian from Rome (always have a friend from Rome as a food writer!). She is a whirlwind, and went straight into the kitchen to try it out. Relief came the next day on my cell phone: a huge thumbs-up in a text message. 1 Place a rack in the center of the oven and preheat to 350ºF. Line a rimmed baking sheet with parchment paper. Add the first six ingredients (oats, nuts, and seeds) to a large bowl and stir to combine. 2 Add the sugar, oil, honey, vanilla, and salt to a small heavy saucepan. Heat over medium-low, stirring on and off with a wooden spoon, for about 5 minutes, or until the sugar is melted and the mixture is blended. 3 Add the wet ingredients to the dry ingredients and stir with a spatula until no dry spots remain. Spread the cereal mixture evenly onto the prepared baking sheet. 4 Bake for 10 minutes. Sprinkle the lime zest across, stir, and even out again. Continue baking until the cereal is light golden brown, 8 to 10 more minutes. 5 Transfer the pan with the granola to a wire rack and immediately sprinkle the additional lime zest across for an extra burst of flavor. Leave to cool completely, about 1 hour; the zest will dry through the residual heat, and the granola will crisp. 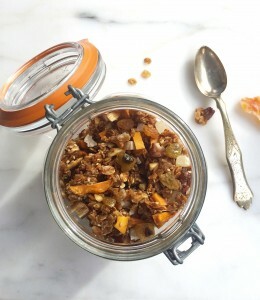 Break the granola into bite-size chunks and add the dried fruit. Store in an airtight container at room temperature. 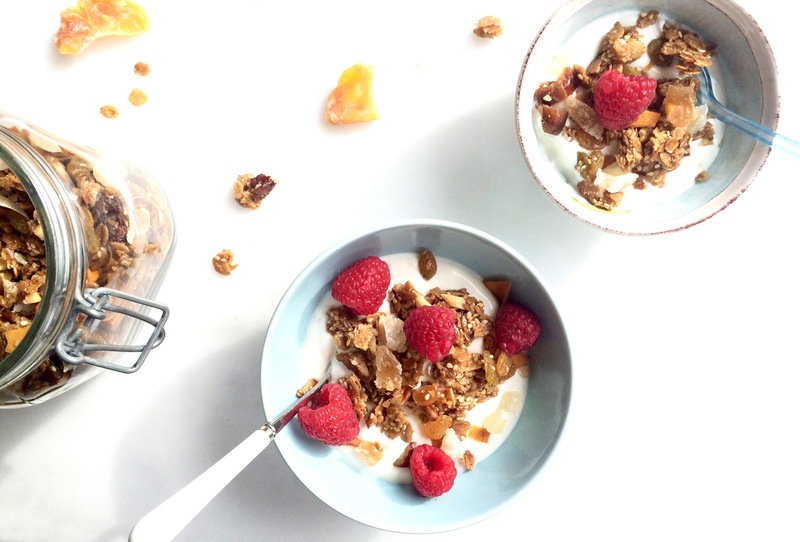 Granola will stay crisp for at least 1 week. Don’t clean your 1/4-cup-measure after adding the olive oil—use it to measure the honey: the residue allows the honey to pour out easily. Use kitchen sears or a large serrated knife to cut unsweetened dried pineapple or other hard-to-cut fruit. (*) I only had light brown sugar at home so I added a bit of molasses: to get 1/2 cup dark brown sugar, replace 1 tablespoon of the sugar (10 g) with 1/2 tablespoon (10g) molasses. (**) I used Bob’s Red Mill 5-Grain Rolled Hot Cereal which contains oats, wheat, rye, barley, triticale, and as a bonus flaxseeds. (***) I love the chewy shards of flaked coconut. I snack on them, or I use them to garnish a bowl of warm breakfast grain in the morning or my muesli. I used Bob’s as well which I found in a local store.